Amazon.com description: Product Description: Meet New York Times bestselling author Isabel Allendeâs most enchanting creation, Eva Luna: a lover, a writer, a revolutionary, and above all a storyteller. Eva Luna is the daughter of a professorâs assistant and a snake-bitten gardenerâborn poor, orphaned at an early age, and working as a servant. Eva is a naturally gifted and imaginative storyteller who meets people from all stations and walks of life. Though she has no wealth, she trades her stories like currency with people who are kind to her. In this novel, she shares the story of her own life and introduces readers to a diverse and eccentric cast of characters including the Lebanese Ã©migrÃ© who befriends her and takes her in; her unfortunate godmother, whose brain is addled by rum and who believes in all the Catholic saints and a few of her own invention; a street urchin who grows into a petty criminal and, later, a leader in the guerrilla struggle; a celebrated transsexual entertainer who instructs her in the ways of the adult world; and a young refugee whose flight from postwar Europe will prove crucial to Eva's fate. As Eva tells her story, Isabel Allende conjures up a whole complex South American nationâthe rich, the poor, the simple, and the sophisticatedâin a novel replete with character and incident, with drama and comedy and history, with battles and passions, rebellions and reunions, a novel that celebrates the power of imagination to create a better world. 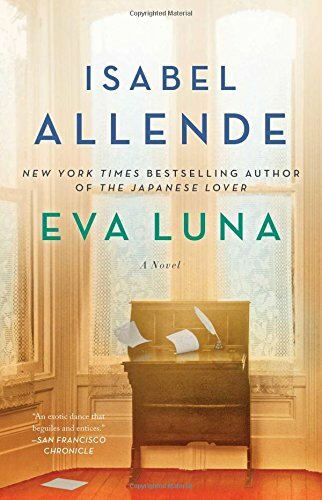 About: Meet New York Times bestselling author Isabel Allende’s most enchanting creation, Eva Luna: a lover, a writer, a revolutionary, and above all a storyteller.